It may be little known in 'the West' but the biggest film festival in South-East Europe is growing fast in scope, acclaim and popularity. Taking place in March of every year, 2006 saw the 10th Edition of the Sofia International Film Festival (SIFF) which has become probably the most anticipated event in Bulgaria's cultural calendar. It started humbly enough in 1997 as what some journalists have described as little more than a rock festival with some music videos. 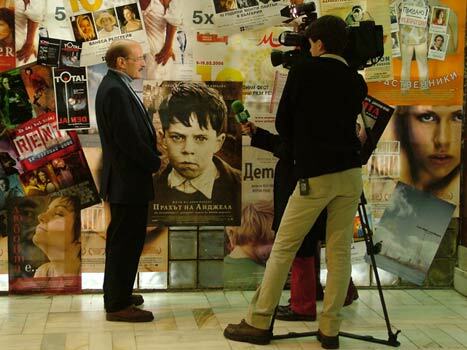 However under the leadership of Stefan Kitanov it has grown to its current size and in 2006, over the course of eleven days, scores of films from around the world were screened in seven different venues in Sofia as well as at subsidiary events in Bourgas and Plovdiv. It says something of the cosmopolitan nature of the events that films are often subtitled in three different languages - Bulgarian, Serbian and English! Needless to say, as well as international offerings, much of the original concept of the festival has remained and SIFF remains a springboard from which homegrown talent can soar. Awards for Best Bulgarian Film and Best Short are handed out next to Best Balkans Film and the FIPRESCI (The International Federation of Film Critics) and Stella Artois Grand Prix. In fact there was good news for the Bulgarian film industry this year when Georgi Djulgerov's 'Lady Zee' scoped both Best Bulgarian Feature and the FIPRESCI Best Film Award. But the Sofia Film Festival isn't all about celluloid. A carnival atmosphere surrounds the screen shenanigans - in fact Stefan Kitanov himself is known to whip out his guitar and strum a ditty or two at parties that go on through the night. All-in-all the SIFF is a great showcase for the city and there can hardly be a better time to be in Sofia.